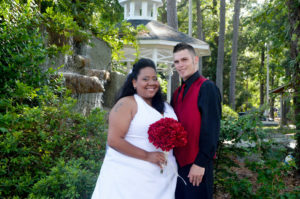 Heather Marie Suggs the daughter of Johnny and Janice Suggs, Jr. of Darlington, SC and Micheal Wesley Thomas the son of Michael E. Thomas and Laura E. Cade of Greenville, SC were united in marriage on September 3, 2016 at Wedding Chapel by the Sea, in Myrtle Beach, South Carolina. Rev. Pam Muise officiated. The Groom’s attendants included James Mardis; Michael E. Thomas; Jonathan Mardis all of Greenville, SC as well as Michael C. Thomas of Statesboro, GA.
A reception at Landry’s Seafood followed the ceremony.